Luong, N.H, Grond, M.O.W, Bosman, P.A.N, & La Poutré, J.A. (2013). 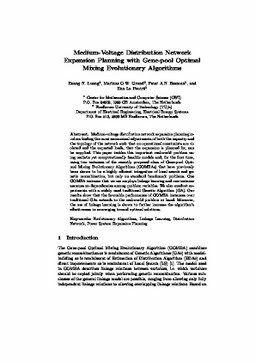 Medium-Voltage Distribution Network Expansion Planning with Gene-pool Optimal Mixing Evolutionary Algorithms. In P Legrand, M Corsini, J.-K Hao, N Monmarché, E Lutton, & M Schoenauer (Eds. ), Proceedings of The Biennial International Conference on Artificial Evolution (EA-2013). Springer.